Laurel and Holly holding their first-place trophies for the robot competition. After two months of work, the big day was finally here. Friday night we drove up to Philadelphia with lots of tools and the robot nestled in a box at my feet. The kids were very excited and we all brought matching robot t-shirts to wear. Saturday morning we showed up bright and early for the Abington firefighting robot competition. I was not sure what to expect and wanting to be absolutely certain of getting a spot with power and a place to test the robot. As it turned out, the organizers had some very nice lab classrooms for us and I didn’t need my power strip and long extension cord. I tested all the sensors on the robot and everything seemed in order. According to the website there were 54 robots registered for the competition. There were a large number of Vex robots and even more Lego NXT robots. Only a handful of robots were non-kit ones like mine. Most of the Vex robots were part of a local club. I had some very good conversations with the guys who run the club. They were very interested in my bot because of its use of expanded rigid PVC and the Arduino platform, a switch that they are considering. It turns out that Vex robots are extremely expensive. They showed me one of their entries, which had a fairly large metal frame and large wheels, along with a number of plug in sensors, I am guessing about 5 in total. They told me the cost of the bot was $850! In contrast I had encoders, far more sensors, and wireless communication, at a parts cost under $150, and — had I had the time — the ability to add more things like line sensors for less than a dollar. Now it is certainly true that I spent more than $850 on this project as part of equipping my workshop with loads of parts “for the next project”, the power saw, and replacing Parts That Burned Out as I learned how to use my power supply correctly. (The list of fallen includes a motor, two encoders, a switching voltage regulator, and an XBee with breakout board.) Still, that is quite a price difference. When I made it over to the practice arena, there were some bad surprises in store. Most of the maze floor was hardwood; well and good, as that is what I had at home. They also had carpet. I knew this was coming, but had expected relatively thin carpet. Not true. This was thick, and worse, it was uneven in height with patterns. On my first practice run, the robot stopped dead. Since I was not running at top speed, I changed the code to boost the speed greatly (knowing that I might pay a price in accuracy in the hardwood portion of the maze). I knew that narrow wheels on that carpet was not going to work well. They would get stuck in the grooves. As luck would have it, that rug was on the path to the single room I had chosen. And so, while I had wanted to avoid any last-minute code changes, I decided to go for another room instead, where there was no carpet. The first thing that happened after that was the robot started running backwards continuously, saying that it was stalled. Turns out I had overwritten an array, which had nothing to do with the stall code, but this was another example of the sensitivity of the system to any coding error. Fixed that, but lost more time. Another weird thing, when I would start my practice runs, the robot would instantly swerve left into the wall. Since this was practice, I could simply hit the reset button and then it ran fine. This happened on both practice runs. Not a good feeling. The competition started with the high school students. Another surprise, as I saw with a sinking heart that there were now two carpets, and no way to avoid them. We watched as 11 robots in a row failed to put out the candle. Robot 12 succeeded…then there was another string of failures. That robot was the only one in the division to make it, and later in the day it was not able to do it again in the second round. It was surprising how many robots made it into the room but were unable to put out the candle. Some of them were thrown off by candle reflections on the white walls — I had uncovered this potential problem in testing at home. The biggest problem, though, is that so many of them avoided using a powerful fan. You get a 25% time reduction factor for using non-air methods. So there were lots of balloons and a few sponges. Only problem is, if you aren’t exactly in the right position, those methods don’t work well. Some folks used fans, but wimpy ones; I am guessing those are the ones that worked most easily with the kits. By contrast, I had a fan designed for providing thrust on airplanes and a dedicated servo to sweep it rapidly back and forth. It was loud as hell but if I got anywhere near the candle, it was going out. The interesting thing is that there was a much easier way to get a time reduction — 20% — by having your robot start with tone activation instead of a button press. This was a no-brainer for score improvement, and I had bought all the parts (a few dollars) but didn’t have time to build it. Yet almost none of the contestants used it. I realized that this is probably because the kits don’t offer a plug-in version of a tone detector. Next was the junior division. They did not have the carpets to deal with, and so, there were a decent number of successes. About halfway through this, I found out that Laurel and Holly’s division had been moved up so that they were now going to be next, not the original schedule. I ran back to reprogram the robot for remote control, plug in the laptop XBee and haul everything back. All in all, quite a bit of running around. Then first run for the senior division. Once again, I put my robot in and wham — straight into the left wall. I later figured out that this was a software bug introduced the morning before, when I hastily added the required button switch. That put a delay in the code, and I put it in the wrong place, so the sensors were calibrating while outside the maze. At the time, though, I had no idea of what was going on. So with dark thoughts about my motors I quickly put in a edit that if the robot hit a wall, it would back up and then turn right. Surprisingly enough, this worked decently for the second run and the robot at least made it down the hallway heading straight. But, then it hit the dreaded carpet, and a wheel got stuck in the grooves. And that was that! Only one robot in the senior division successfully completed two runs (I think). A man named Paul B. had brought a beautiful pair of robots in for a swarm demonstration. Two robots working in coordination searched each room for the candle and put it out, choreographing their moves, and returning home to nestle back together at the start. Needless to say they were also well capable of putting out the candle acting alone. They moved wonderfully smoothly, with no carpet issues. After the show I talked with Paul a bit. The first thing I asked about were the motors, and these were indeed high-grade medical motors that cost over $100 each new. (Mine were $8!) Like me he had encoders, and interestingly enough they were about the same counts per revolution. Since his were integrated into the motors, it was much cleaner. I had 10 wires going into my breadboard from my encoders, and while they never got loose, it was ugly. His robots didn’t seem to have any wires anywhere, though there must have been some. Lovely PCB boards with surface mount components made for a spare, elegant design. Although I would have liked to do better, we had a great time at the event. 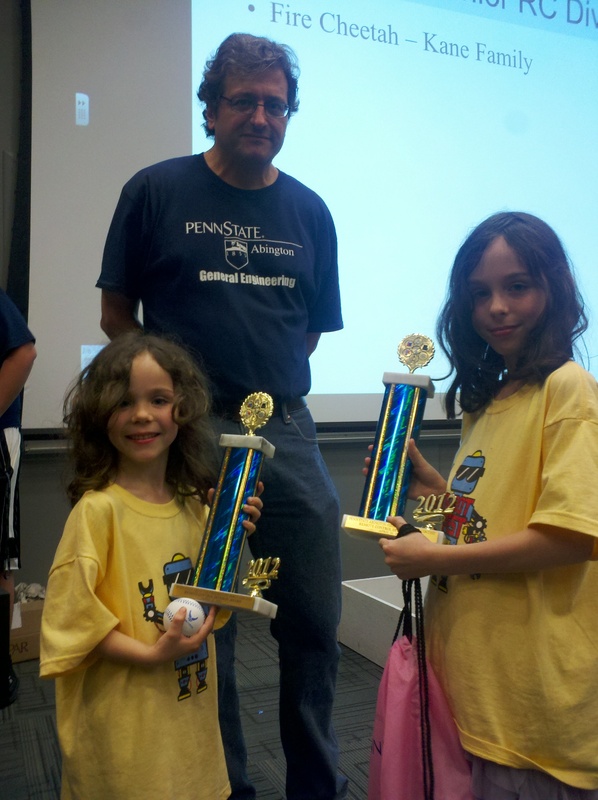 The kids got two very nice trophies, and I met a lot of cool people, too many to mention here. The organizers were friendly, not to mention that we got free food, and the entire event was free! I’m very glad I came here instead of Trinity. Have more time to get everything done and tested! Use different wheels. Those were my biggest limitation. Small, wider, and better traction. The wheels were part of the motor/encoder package. Since I was not at all thrilled with the motors, I will upgrade to a higher-quality pair with integrated encoders. Even with good motors, relying on a robot to go straight is never robust design. I will spend much more time building in recovery behavior. With all the sensors I have it is possible to choose a reasonable course of action. Most robots in the show hit a wall at some point and then they were doomed. My battery was a little big and heavy. Might change it. On the other hand I have to say it performed well. Designing PCB boards would be fun, though of course this assumes you have a fixed plan for that component! I’m happy to say I’ve crossed off a big item on the list already, namely moving to a real development environment for the Arduino instead of the toy one that comes with it. Turns out Visual Studio has an Arduino plug-in that works great and is effortless to install. And now, time to catch up on real life.